LAKE PLACID, N.Y. -- The 2011-12 season was full of highs and lows for Mika Zibanejad. He's aiming to level things out a bit this season. From the highs of a top-line opening-night role in the NHL and a golden goal to the lows of being on the last-place team in the Swedish Elite League, Zibanejad went through it all. He started the 2012-13 season on a good note this week at the USA Hockey National Junior Evaluation Camp, helping Sweden go 3-1 in its four games here. The forward didn't get on the score sheet in Sweden's tournament finale Friday, a 5-2 win against Finland. Carolina Hurricanes prospect Victor Rask had a goal and an assist, and Jakob Lilja, Rasmus Bengtsson, Oscar Klefbom and William Karlsson each added a goal. Goalie Niklas Lundstrom stopped 24 of 26 shots. Finland, which fell to 0-4 with one game remaining, got goals from Robert Leino and Juuso Ikonen. Janne Juvonen, who allowed all eight goals in Finland's 8-2 loss to Sweden on Tuesday, played the third period in relief of Richard Ullberg and stopped all 11 shots he faced. Zibanejad, like Rask and Karlsson, was part of last year's Sweden team that won the gold medal at the 2012 World Junior Championship. The final game against Russia was scoreless heading into overtime when Zibanejad scored 10:09 into the extra session to give Sweden its first title in the elite under-20 hockey tournament since 1981. "It was obviously one of the biggest moments for me in my hockey career so far," Zibanejad told NHL.com. "It was unbelievable. Obviously it makes it more special because [the last gold] was 31 years ago. It's a big thing back home, and it's been bigger every year. We got closer every year. People are interested in how we're doing. It was amazing." It also was the exact pick-me-up Zibanejad needed during a rough first half of the season. Taken by the Ottawa Senators with the sixth pick of the 2011 NHL Draft, Zibanejad started the season in Ottawa on a line with team captain Daniel Alfredsson. He had an assist in the opening-night 5-3 loss against the Detroit Red Wings, but that was the only point he had in nine games. On Oct. 26 the Senators returned him to Djurgardens in the Swedish Elite League. "The longer it went, you could see with him, the loss of confidence," Senators assistant general manager Tim Murray told NHL.com. "The NHL is a tough league for anybody, especially an 18-year-old kid coming from Europe for the first time. I thought he played pretty well. He had some good games [but] I think it was the right thing to do to send him back." Zibanejad wasn't happy to leave, and said early in his return to Sweden it was a struggle. Djurgardens was losing games and many looked to Zibanejad to pull the team up the standings. He couldn't do it, and the team finished 11th in the 12-team league, then lost its relegation-round playoff series and will play this season in Allsvenskan, the second division. Zibanejad had five goals and eight assists in 26 games. He added four goals and two assists in 10 games in the relegation round, but it wasn't enough. "It was tough in the beginning back home with all the pressure," Zibanejad said. "It was good a learning experience, for sure. Unfortunately our team didn't do too well last year." Zibanejad said the World Juniors was his saving grace last season, and Murray said he noticed after the tournament Zibanejad playing with the kind of confidence that motivated the Senators to draft him so high. "He did play better in the second half over there, for sure," he said. "That's the type of goal, you certainly can't go to bed thinking about it every night, but it has to help your confidence. … Just scoring that one goal alone, that doesn't make a tournament, but it certainly made Sweden's tournament. You could see the improvements in his game." Murray said he believes all the experiences Zibanejad had last season -- the good and the bad -- only will help the 6-foot-1, 200-pounder going forward. "It was a tough year in Djurgardens, they finished last and they're in Allsvenskan this year," Murray said. "For a storied franchise, for that to happen, it was tough. You could see games where he was on the third line and he was a young guy on an older team. There were some tough nights for him, but in saying that, that helps you develop character, helps you understand every night it's not going to be roses and rainbows. It's how he responds to that this year that determines what he is." That process started at Senators development camp, when Zibanejad arrived bigger and stronger. There's room to grow and improve on and off the ice, but Murray said he's happy with what he's seen so far. "He's getting stronger," he said. "He was a big kid when we drafted him but he was raw. He had a lot to learn about nutrition and the different things we try to do at development camp. … There was a lot of room for improvement. I still think there are things that he can do better -- he can get quicker, he can get stronger. For a strong guy, he can be stronger on his skates. But it's a process and that's what we're trying to do." While Zibanejad's teammates returned to Sweden after Friday's win, he instead left for Ottawa for a month of training with the NHL club prior to training camp. It's something Zibanejad did last year and felt it helped enough for him to do it again. "I thought it was good last year when I went there earlier and training with the guys," he said. "… When you're this young you have to focus on everything. You've got to focus on being bigger and stronger and faster. It comes when you grow into your body. You can take everything in and kind of work on that. I had a pretty short summer this year. I've been training hard and focused on getting stronger to play in the NHL, and to play all 82 games you have to be strong and fit and be ready to play every second night." He also knows he'll be playing in North America no matter what this season -- either with the Senators or their American Hockey League affiliate, the Binghamton Senators, which will make things a bit easier for him mentally. "I have my mind set on staying there," he said. "I don't have to worry about going back [to Sweden]. I think I can relax more and kind of just don't get too nervous or stressed out about how I only have two games left [before his contract starts] and the decision is going to be made. It's a totally different situation for me now this year. For sure I'm going to be here now. If I go to [Binghamton] I'll have a chance to play good there and maybe be called up. But the first goal and first priority is to stay up [in Ottawa]." 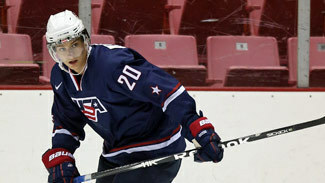 If he is in Ottawa, that likely means he won't have a chance to help Sweden repeat as WJC champions at the 2013 tournament. Sweden coach Roger Ronnberg said he doesn't expect to have Zibanejad for his team's repeat attempt, but said, "If he's available I'm more than pleased [to take him]." However, Zibanejad said he'll be happier if his final moment as a junior-hockey player was celebrating after scoring the gold medal-winning goal at last year's tournament. He's ready to put last season -- good and bad -- behind him. "I don't know if I'm going to play World Juniors or not," he said. "I can't think about that now. My focus is to stay up in Ottawa."